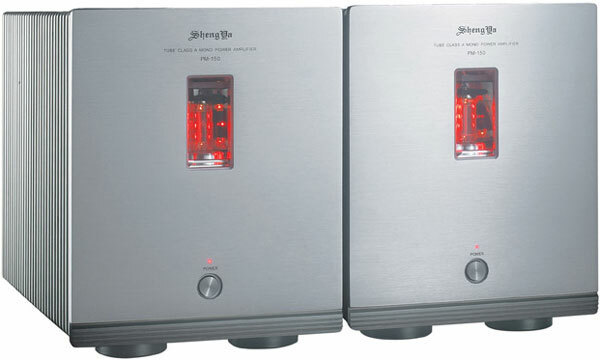 The PM 150 Tube hybrid mono amps from Shengya interested me right off for two reasons. 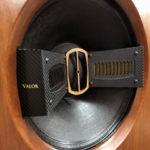 First, they are hybrid designs which make them somewhat different than the usual monoblocks on the market; and second, they are imported through Grant Fidelity. I reviewed the Grant Fidelity Rita integrated amplifier that retails for $4,200 and was interested in some of the other products Ian and Rachel of Grant Fidelity were importing from China. 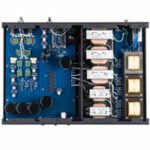 With the PM 150 hybrid power amps selling at $2,400 per pair to go along with my $1,200 Rotel RC 1082 preamp, I was interested in determining what sort of advantages besides price might be in store. The obvious advantage of going separates is that we have a choice of preamp and power amp and the ability to find our own amplifier synergy, not to mention the increased power usually afforded to separates. The PM 150s are rated as 150 watts 8 ohms and 300 watts into 4ohms, and running in “Class A” up to 10 watts and then switching to class A/B. Now, I am the kind of reviewer who happens to be in the high-efficiency speaker and low-powered single-ended amplifier camp. I just find that these systems despite their less than thrilling technical specifications tend to sound better than alternate approaches. I also tend to believe that true synergy is better served by going with a similar voice or similar philosophy from source to speakers. Nevertheless, I do try and keep an eye out for systems that run counter to my “general” preferences so as to keep an open mind. With the Shengya PM series of products, I could see that the designers obviously wanted to keep tubes in the chain to retain some tube magic while also having a huge amount of power on tap and all at some sort of a sane price point. I can’t imagine needing more power than these monoblocks but apparently they have two power amps above this model at more than double and triple the power output. Indeed, Ed Momkus reviewed their statement flagship power amps. 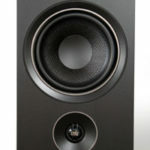 My Audio Note J speakers are quite happy with about 8 watts, so 150 watts per side is ridiculous overkill. Indeed, I doubt I ever got the amps out of their “Class A” operation and thus I probably always heard them at their very best. As expected, the Shengya power amps are massively built, weighing in at about 40lbs each. I say “as expected” because everything I have seen from Grant Fidelity is built way above its price class and the PM 150s are no different. At $2,400 for the pair, you start looking around at the competition’s offerings of power amps or monoblocks for the same money and the PM 150s come out at or near the top of the group. The fit and finishis first rate as are the speaker terminals. My only gripe here is the power cord connectors which never had a very tight grip on the power cables themselves. I like a tight feel like they’re locked into position. I connected the high quality power cables into Grant Fidelity’s RPF-120 MKII Reference Power Conditioner which is an upgraded version of the power conditioner I reviewed previously as part of a system review. I have decided to purchase the power conditioner as sometimes you don’t know what you’ve got until it’s gone. Each PM 150 monoblock has a power switch on the front and once depressed, the power light flashes for several seconds presumably to warm up the tubes and to stabilize the amp. The red glow behind the tube would turn on and a minor thump sound could be heard out of the speakers when the power light turned solid. No other anomalous noise would be heard at anytime during playback for the several months I had the power amps in for review. I must say right off that Audio Note speakers typically don’t like high-power high damping factor amplifiers. Audio Note recommends single-ended low powered tube amplifiers because large solid-state amplifiers tend to bully the speakers thinning them out and making them sound rather two-dimensional and sterile. The Grant Fidelity Rita sounded very good but even here they tended to bully the speaker a little more than I would like, which is why I ultimately kept the single-ended Audio Note OTO. Still, the PM150 is a different concept with a different tube compliment and I have to say that these power amps, even with the Rotel, managed to be an intriguing counterpoint to the Rita. The PM 150’s with the RC 1082 had a more fleshed out organic presentation particularly in the bass. The Rita had a fast tight presentation but the Shengya monoblocks sounded more organic and seemed to allow notes to decay a little longer and more naturally across recordings. The Rotel RC 1082 is a different animal from previous Rotel preamps and it’s quite an excellent preamplifier with a huge feature set compared to most preamps for similar money. However, it isn’t the last word in preamp design. And yet the combination of Rotel and Shengya sounded quite pleasing no matter what recordings I used. The combination had an open airy treble seamlessly and convincingly integrating to the lower registers with few quibbles except for some treble hash. Though, it should be noted that this was more from the Rotel than the Shengya as I had auditioned similar issues with the Rotel preamp mated with other power amps. The Rotel/Shengya combination is a big powerful sounding pairing with some rounded dimensionality and retention of the famed tube organic sensation afforded to better tube designs. I actually liked the sound here more than the Grant Fidelity Rita because this system retained the Rita’s abilities in the upper frequencies while providing superior bottom-end resolution and decay characteristics. I have tried other solid-state power amps of similar price points from the likes of Bryston and Rotel with the AN J’s and found them to be rather fatiguing and thin compared to the Shengya PM 150s. The interesting thing about the PM 150s is the ability not to sound like big power amplifiers with the rush of “air” that seems to me to sound a little forced and clinical and ultimately artificial. The PM 150 monoblocks have more power than most people will ever need, but they sound more fleshed out than typical solid-state power amps. Is the tube acting as a kind of buffer to add euphonic distortion? Perhaps, but the ultimate goal is to make music sound more like music and not necessarily to win the measurement tests. I listen to a wide array of music, from larger scale classical, vocals, jazz, to harder rock and dance, hip hop, and metal. The monoblocks could quite easily navigate all of this music on a macrodynamic level but it was quite surprising to hear how well they handled the microdynamics and nuance. While some of the microdynamics were somewhat hampered by the Rotel’s already limited resolution of subtlety, I kept reminding myself that this is not a $20,000 rig but a quite affordable front-end. Add to that the overachieving $300 Grant Fidelity Tube DAC 09 did not at all sound out of place here, then I could not help but smile. In fact, I ran the Tube Dac 09 as a preamp to the PM 150 monoblocks, and while the Tube DAC 09 as a DAC is better than it is as a preamp, I was very highly impressed with the overall sound for a sub-$3,000 amplification set-up with DAC in. I kept coming back to the idea that sound this good should not be had at this price. The Rotel sounds better than the tube DAC 09, but then it should for four times the price. Meanwhile, the PM 150 monoblocks were able to allow me to discern the differences between the two preamps. This, of course, leads to the advantage I mentioned earlier, that of upgrading the preamp stage. If sound this good can be had with budget preamps. then what would a much better preamp be able to bring to the table? The natural question for people looking at the Grant Fidelity site and their numerous options would be whether I would opt for the Shengya PM 150’s and a quality preamp over the terrific Rita integrated. In my system I would have to opt for the separates. The PM 150’s with the Rotel has a superior top-to-bottom presentation and a more three-dimensional organic presentation with regards to decay without losing anything in the midband and treble. The PM 150 has considerably more power than the Rita (though the Rita will drive most everything so it may be moot) and allows for easier upgrade options with superior preamplifiers, which may include Shengya’s own matching preamps. The PM 150 amplifiers are superb power amplifiers. 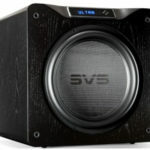 They sound very good with speakers that barely make use of their power reserves illustrating that they are not just brute force amplifiers but have refined sensibilities. There are a lot of power amps and monoblock amplifiers in the same general price bracket, but few solid-state power amps offer the tube subtlety and low-level organic presence that the PM 150 musters. Hybrid monoblocks also allow for subtle or perhaps not so subtle changes to the sound via tube rolling which will no doubt be very appealing to the folks who already have hybrid systems. They are definitely worth your attention if you want big power and a clean neutral presentation, but also some of the wholesome non-fatiguing aspects of most good tube amplifiers.